In stock 46 items in stock. Note: It is recommended to use a current limiting resistor with the backlight colors. You can burn out your LEDs if you do not use a current limiting resistor. Try using a 1k Ohm resistor. The backlight is controlled by pins 18, 17, and 16. Quick question for you guys this morning, I have 4 of those screen hooked up in parallel with a different enable for each screen. I can print whatever character I want on any display. The problem that I have is that a weird characters are showing up after a couple of minutes to a couple of hour. It doesn't erase what was initially written, but it is kind of annoying. Any clue about what is going on? 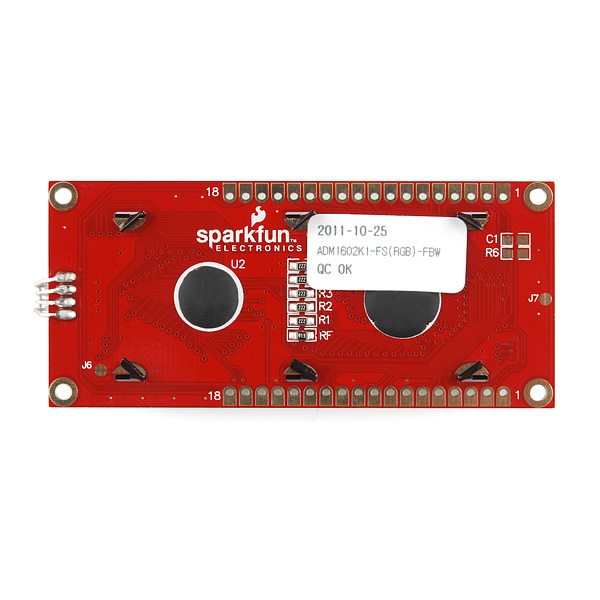 There was a customer [ https://www.sparkfun.com/products/10862#comment-505c54de757b7f2a26000000 ] that wrote example code for this product. 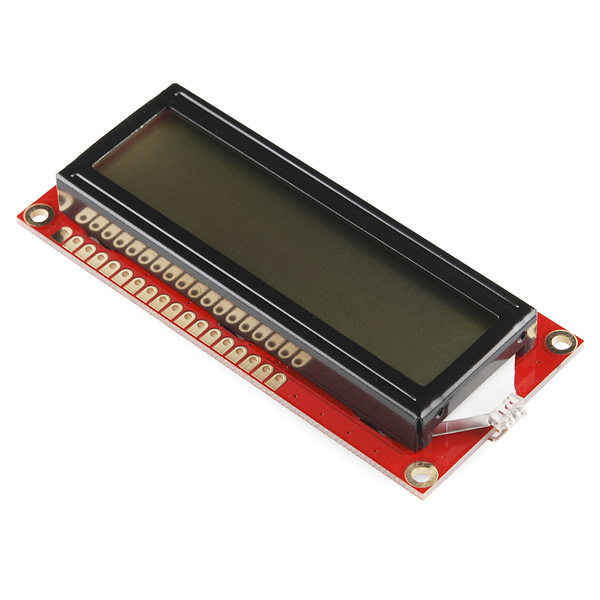 Try looking at his GitHub repository [ https://github.com/lImbus/ArduinoShield_SFE_2x16LCD_RGB/blob/master/ArduinoShield_SFE_2x16LCD_RGB/ArduinoShield_SFE_2x16LCD_RGB.ino ] . It is recommended to use a current limiting resistor with the backlight colors. You can burn out your LEDs if you do not use a current limiting resistor. Try using a 1kOHm resistor. 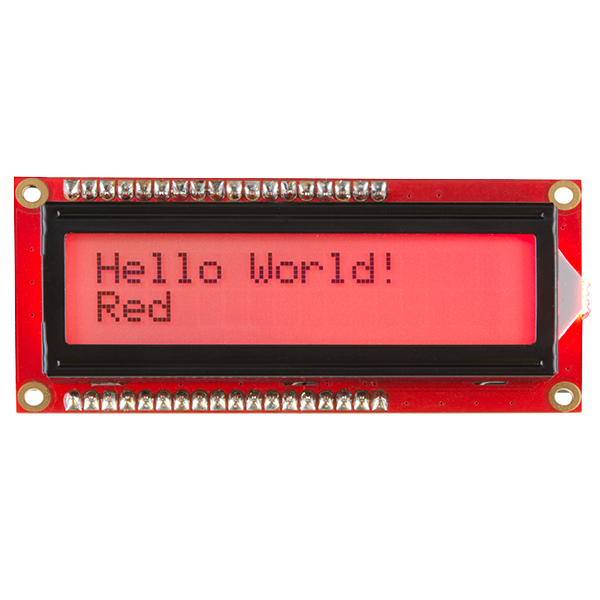 To reduce the number of connections, maybe you can use the serial enabled backpack [ https://www.sparkfun.com/products/258 ] to control the characters being sent to the LCD. One thing to note is that the RGB 16Ã2 LCD has a different pin out on pins 15 and 16. Also, the RGB 16Ã2 LCD has two additional pins to control the backlight colors. 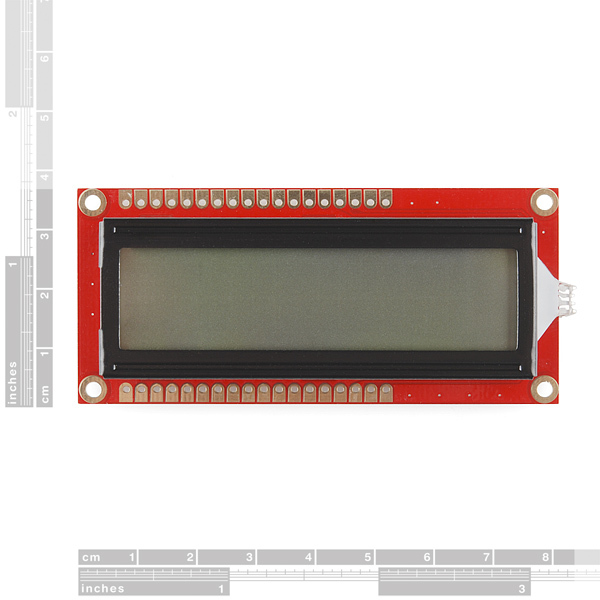 The LCD backpack would not be pin to pin compatible like the other basic character LCDs but you would be able to send serial characters. I'm so mad. I burnt out the red and green LEDs because no where on the data sheet does it say anything about using a resistor. Make sure you use 1k resistors on pins 16,17,18!!! What's the forward voltage drop & max forward current for the LED? We need to limit the LED current externally, yes? I believe you may want to mention in the description that this has a common cathod led. I had a hard time finding it in the datasheet. Oh come on guys, don't you know how to find out the specs of an LED? build an LM 317 variable constant current driver (you need only a small 2K Pot, 47 ohm resistor and a 317). power it up with 5V on the 317's input. now the led will glow dimly and the meter will read less than a milliamp. slowly turn down the pot while watching the LED which should slowly increase brightness as you're doing this. At one point, the LED's brightness will suddenly drop. stop turning the pot and back up until it's growing at max brightness again. now check the meter; this is the maximum current that LED can take. Use the LiquidCrystal library. This takes more than half the pins of an ATMega and most of the pins of an ATTiny84. You can, however, share the four data pins with other devices that have chip select logic so that only one device masters or reads from those pins at once (that is, make it into a real data bus). I usually share 3 of the 4 with the ISP/SPI pins. As long as the LCD's E pin is not asserted during programming (which would be unlikely), it works fine. Use the AdaFruit RGB LCD shield and the LiquidTWI2 library. Use an i2c "backpack" and LiquidTWI2. The quintessential example of this is available from the OpenEVSE store, but that's not the only version. 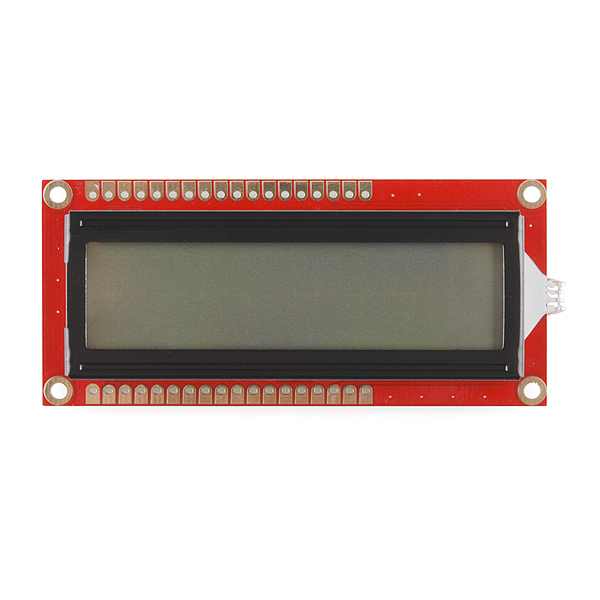 Essentially you wire an MCP23017 up to the LCD the same way as the AdaFruit shield and bring the i2c and power out to a 4 pin SIP connector, all on an 80x36 mm board that fits exactly onto the back of the LCD module. LiquidTWI2 is particularly nice because it not only supports the 5 button inputs, just like the AdaFruit shield, but also supports using the last unassigned pin on the MCP23017 to drive a piezo speaker to make beeps. I've designed a backpack that includes the piezo. You can find it on my OSH Park profile. One thing to beware of is that there are four different variations on the 2x16 char RGB LCD - positive or negative (aka transmissive or transflective) text; and common cathode or common anode backlighting. There's no wiring difference between transmissive or transflective, but for common cathode or common anode, you need to connect pin 15 either to +5 or ground and invert the sense of the RGB backlight control lines. LiquidTWI2 includes an initialization constant that lets you "hint" it that the backlight is inverted, but for most backpack/shields you would need to rework the board to change the connection on pin 15. It would be somewhat nicer if the makers of RGB shields and backpacks would include a two-way solder jumper to allow the buyer/assembler to select the polarity of the common pin more easily. Of course, it would also be somewhat nicer if everyone would pick an LED type and stick with it, but whatcha gonna do? Why only a parallel version of the display with RGB lighting? It looks like there is a much easier serial version of all of the single color models. Do you need to add anything extra to the pins? Because I tried to use the Arduino example and it didn't work. Did you include a potentiometer to adjust the contrast? See this tutorial for details. any plans to allow the serLCD backpack to work with this? The resistors for the RGB Backlight LED are based on the values found by M-Short in his comment. I diverged from the traditional LCD Pin Layout as in http://www.arduino.cc/en/Tutorial/LiquidCrystal so that it can be used with an Arduino Ethernet or Ethernet Shield without having to change the hardware / electronics. This means that now there is no analog input pin free tho. So, I'm envisioning hooking the RGB pins up to PWM outputs on an Arduino (i.e., one each) to do a bit of color mixing. What I'm wondering is if I could then stick a pot, namely COM-11173, between GND and pin 15 of the LCD to get a sort of rudimentary 'master' brightness control. Any thoughts? Check out http://www.robotroom.com/PWM4.html, scroll down to the section on dimming 7-segment displays: he shows you how to hook a PWM signal to an NPN transistor to vary the brightness of several common-cathode LEDs at the same time. This is a comparison between Sparkfun's 16x2 LCD with RGB backlight (POSITIVE) versus Adafruit's 16x2 LCD with RGB backlight (Negative). I believe you may want to mention in the description that this has a common cathode led. I had a hard time finding it in the datasheet. I had read somewhere that this had the same pin15/16 wiring as the "LCD add-on Kit for SIK" which is a common Anode. 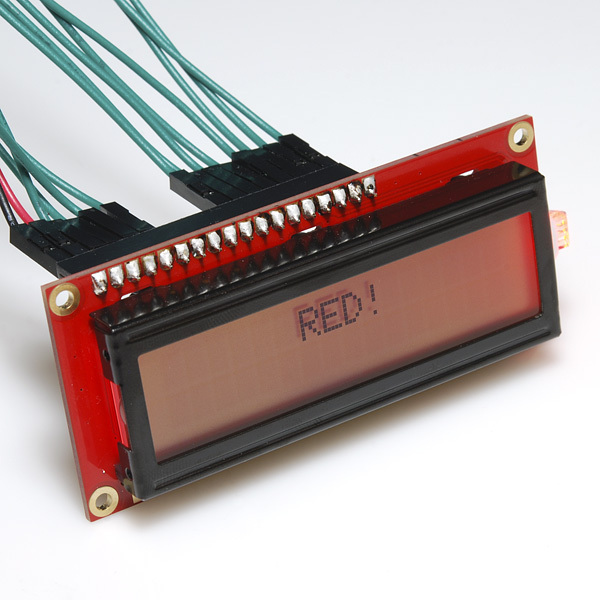 I got concerned when I saw the datasheet for this LCD. But good news. The PCB is setup with the same pinout as the SIK add-in. It is setup with a common Anode. I modified my datasheet-PDF and renamed it as SF-version. So this was easy to setup, just swap boards. But I agree that when I saw the contrast I will save this board for later and also wait for an RGB-on-black! So just so I understand correctly, this backlight is common anode? Is the red color a lot dimmer normally? Mine is significantly dimmer than the green or blue. my red is dimmer as well, green and blue are a lot brighter, are you using any resistors? what voltage are you applying? Well, the red on mine is dimmer now. It was as bright-ish as the blue/green for a second. I thought I had burnt it out completely but I can still see the nub on the end of the backlight turn red, not enough to really light the background anymore. I wished I had known what resistor to use before hand. I think I half burned it out while trying to figure out that the K terminal, (pin 15), is Ground for the backlight. Pins 16(Red),17(Green)and 18(Blue) take a positive voltage to activate. I never had a backlight on my LCD display before, pretty cool. If the refresh time is fast enough & the font has an inverted mode, it could probably do multicolored characters. That is a neat idea, but if these are anything like their other color LEDs the refresh rate is no where fast enough. I got excited when I read this in the new product post, but was disappointed to find that it is Black-on-RGB and not RGB-on-Black. Do you think it would be possible to swap the top polarizer from the white-on-black with this? On one similar display I was able to inverse image simply by taking it apart and flipping over the polarizer. On another similar display it didn't quite work that way because the polarizer wasn't cut at 90 degrees but some odd angle, so I had to get a piece of polarizing film I cut myself, rotated to get the best image. Thanks. I have a white-on-black LCD screen. I think I will get this and try swapping the polarizers and see if that will work. I would also like to see RGB text on black background. Very cool and useful concept though. Now I just need some RGB EL-wire! You might want to check out Adafruit Industries -> https://www.adafruit.com/products/399. They have a RGB backlight negative LCD 16x2 + extras - RGB on black. Personally I wish SF would carry the 7 inch displays. With all the tablet computers on the market, you would think more people would want a bigger display. YES, I understand you need more horse power under your Arduino hood, but with the new Arduino out there, and the Max32 Chipkit with DMA you would think you could build a project to handle a 7 inch screen. Is the controller HD44780 compatible? Datasheet has nothing on interfacing this display. If it is compatible then you could use 4-bit mode to reduce the pin count. Hmmm with that many pins needed might be good idea to add i2c interface. check the serial-enabled backpack below. it won't directly control the RGB backlight (it's only setup to control one of the pins), but it can drive it over serial. Everything works fine, but the red backlight on my device is quite a bit dimmer than the green and the blue for the same current. Also, I had to switch to a 330 ohm resistor to get the red to be possibly reasonable; it draws 8.4ma R, 6.3ma G, 6.14ma B. It would be nice to know the limits of the various current draws instead of merely "Try using a 1k Ohm resistor." The data sheet does not appear to specify. I am using the LCD to display oven temperature on a custom bbq setup. Setup went smoothly and the readout works exactly as needed. It would also be nice if it came with a header, at least loose in the package.